Unlike its name, French Coconut Pie did not originate in France but was actually invented in America. Wherever it originated from, it’s one of the easiest pies you’ll ever make and tastes amazing to boot! You can make your own pie crust if you want to. I have a great recipe for homemade pie crust here. Or you could just purchase a ready-made pie shell from the grocery and save yourself some work. Either way, this pie turns out delicious! It’s literally a pie to die for. Bake pie crust for 18-25 minutes until lightly golden on the edges. Mix all ingredients together in a medium bowl until well combined. Pour filling into pre-baked pie crust. Crust doesn’t have to be cool for this step. Bake 45-55 minutes or until lightly browned and custard is set. Transfer pie to a wire rack to cool completely, at least 1 hour, before serving. I’ve had this recipe for years but hadn’t made it in a long time. One day, my daughter, Tissi, decided she wanted to make herself some quiche. She’s a veggie eater and she loves quiche so I dug up my recipe for her. The problem was when I wrote it out for her, I said it only needed one pie crust. Needless to say, she ended up with a ton of extra filling. It wasn’t until a couple of attempts later that I realized my recipe was actually for TWO pies! Poor Tis. She couldn’t figure out why the recipe wasn’t working for her. LOL! If you want to make just one pie, cut the recipe in half. Otherwise, make sure you have two pie crusts ready. Line pie crusts with foil, fill with rice, beans, or pie weights, and bake for 10 mins. Remove foil and pie weights, return crusts to oven, and bake an additional 4-5 minutes or until crusts are set and dry. Remove crusts from oven and set aside until ready to use. In a medium bowl, whisk together eggs, half-and-half, salt, and pepper, using a wire whisk. Sprinkle in flour, whisking vigorously back and forth to break up any lumps. If you have a few tiny lumps left, don’t worry about it. They’ll disappear into the quiche. Stir in spinach and feta cheese. Divide mixture evenly between the two crusts. Bake for 35-40 minutes or until a knife inserted in center comes out clean. If necessary, cover edge of crusts with foil to prevent over-browning. I had to take some appetizers to a party so decided to make mini seafood potpies. I love potpies but we usually make them with chicken. I thought seafood would make a nice change. You could do this with shrimp only or crab only. Or you can add lobster or scallops for more varied seafood. Just make sure your combination of seafood totals half a pound. If you like, you can double the filling recipe to make one deep dish potpie. Add the onions and mushrooms and cook, stirring occasionally, until softened, 3 to 5 minutes. Add the flour and cook for 1 minute, stirring constantly. Add the milk, clam juice, and sherry. Bring to a boil and cook, stirring, until thickened, about 2 minutes. Stir in the crabmeat, shrimp, and parsley. Meanwhile, unfold pastry sheets on lightly floured work surface. Cut out 12 circles a bit larger than the size of the muffin cups you will be using (you may need to roll the pastry out a bit to be able to cut 12 circles). Cut out 12 mini fish shapes from puff pastry scraps to top each pie. Press the pastry circles into the wells of your muffin pans. Make an egg wash by beating the egg with 1 tablespoon water. Brush the pastry crusts with egg wash and bake for 6-8 minutes. Fill par-baked crusts with seafood filling. Top each with one of the mini puff pastry fish you cut from the scraps. Brush top crust with extra egg wash.
Return to oven and bake about 15 minutes or until top pastry is puffed and golden. I always wanted to taste a Frangipane Tart. I’d read about them but never tried one. 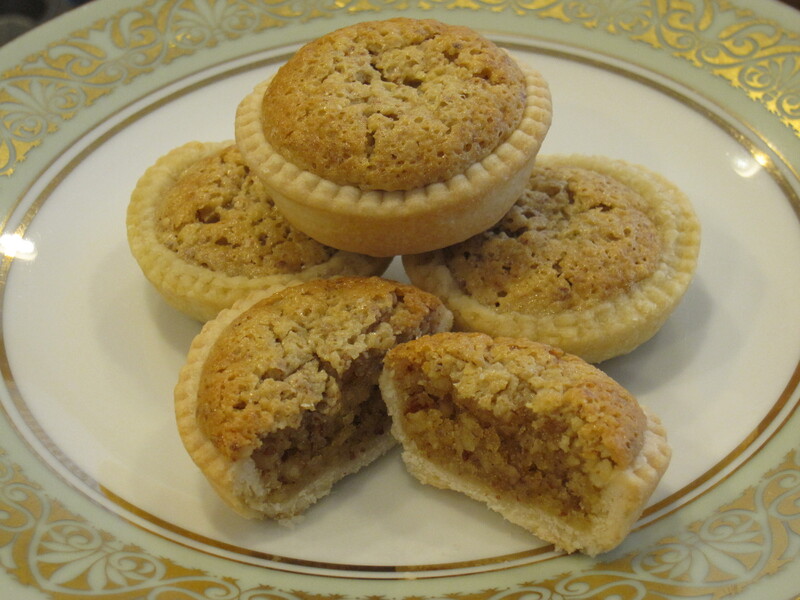 All I knew was that the filling is made from finely ground almonds and is used in pies, cakes, and pastries. It does sound very similar to, if not the same as, the filling in a pithivier which I absolutely love! Frangipane tarts often have some fruit, like raspberries, added to the filling. Anyway, I needed a dessert to take to dinner at my sister, Helen’s house and I remembered that my Mini Pies cookbook had a recipe for frangipane tarts that I had bookmarked to try someday, so I decided today would be as good a day as any. I do own an electric pie maker (the book was written for use with an electric pie maker) but opted not to use it. Instead, I made little tartlets in a mini-muffin pan and was able to get 24 tartlets out of the recipe. Cut out 2½-inch circles of pie dough or size needed to line your mini-muffin pans. Press dough circles into wells of each of the muffin cups. A tart tamper makes this easy to do. In a food processor, combine toasted almonds and sugar. Process until mixture is finely ground. Add the butter, egg, egg yolk, vanilla, and almond extract, if using. Process until well-blended and smooth. Fill each crust two-thirds full with the filling mixture. Bake at 350ºF for 12 minutes or until filling is puffed and slightly cracked. Allow to cool completely, then dust with confectioners’ sugar. 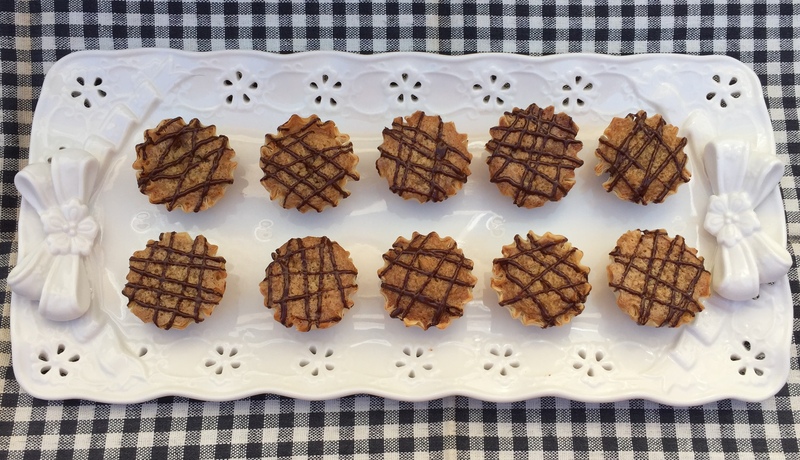 You could decorate the tops of the tartlets with fresh raspberries or additional almond slices, if desired. NOTE: If you want, you can make one large tart. Just fit the crust into a 9-inch fluted tart pan. Place in the freezer and freeze for 20 minutes. Remove crust from freezer, line with parchment paper and fill with pie weights or beans. Bake crust at 350ºF for 20-22 minutes. Remove pie weights and fill pre-baked crust with filling mixture. Bake an additional 35-40 minutes or until top is set. I call this quiche “Real Man Quiche” in homage to the book “Real Men Don’t Eat Quiche” that was published in the early 80’s. 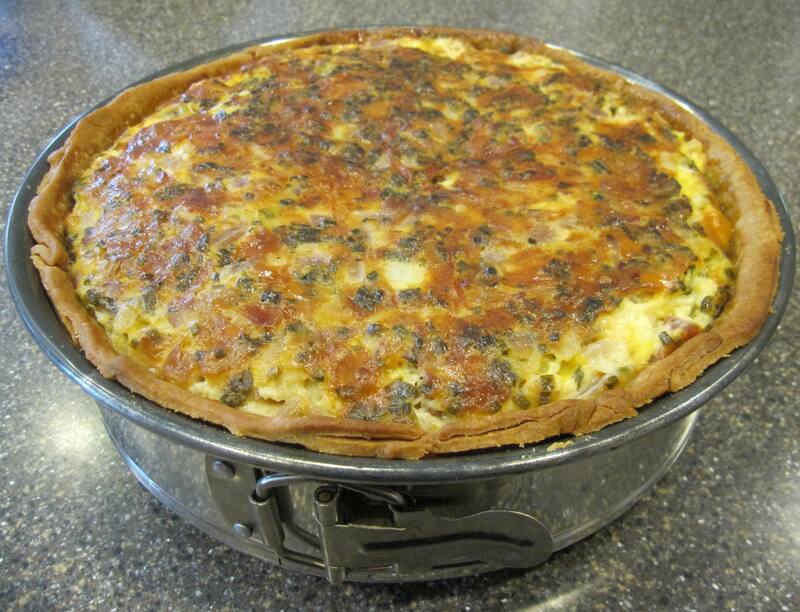 Well, in my family, the men are as real as they come and they do eat quiche – specially when the quiche is a giant, meaty one like this one. Number 1 likes this deep-dish quiche because he feels it doesn’t leave him hungry like a wedge of regular-size quiche does. 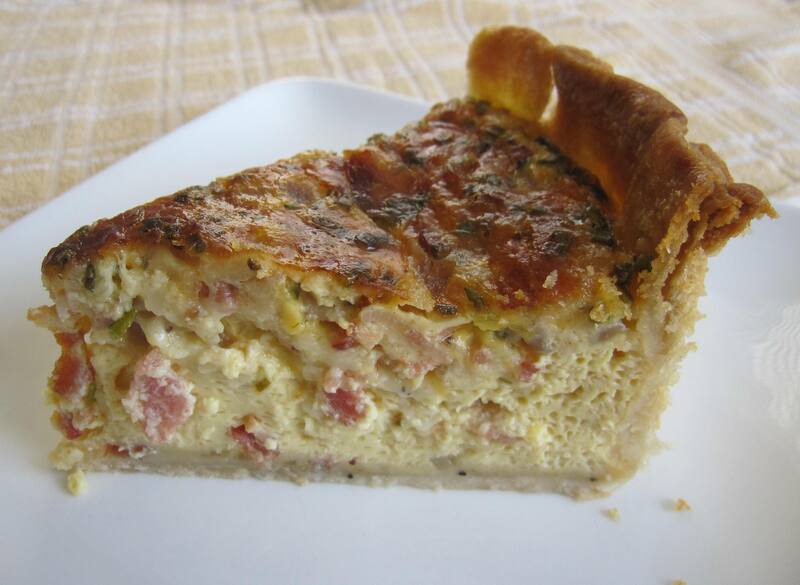 It’s basically the same as a normal quiche only with more meat and double the base ingredients. A springform pan makes it easy to unmold the big, heavy pie. Serve it with a salad or a nice bowl of soup and you have a filling, man-satisfying meal. Cut in butter with a pastry blender or your fingers until mixture resembles cornmeal. In a small bowl, beat egg yolk with 5 tablespoons ice water. Add egg yolk mixture to dough and work in with your fingers until dough comes together when squeezed in your hand. If it is too crumbly, add more ice water, 1 tablespoon at a time, until dough holds together. Shape dough into a disk, wrap with plastic wrap, and chill until firm, about 30 minutes. With a rolling pin, roll out dough into a 13-inch circle. Lay dough inside a 10-inch springform pan, fitting dough into the bottom and up the sides of the pan. Trim off any excess dough. Freeze scraps for future use. In a skillet over medium heat, fry bacon until crisp, remove from grease and drain on paper towels; then crumble into pieces. Remove all but 2 tablespoons of bacon grease from skillet, add the onions and cook until opaque. In a bowl, beat the eggs together, then whisk in the milk or half-and-half. Stir in the crumbled bacon, cooked onion, ham, spinach, cheese and flour. Remove foil and continue to bake until set and center jiggles slightly, about 15 minutes more. Cool about 45 minutes to an hour. Remove ring from springform pan, transfer quiche to a plate and slice into wedges. Chess Pies are traditionally flavored with vanilla, though there are a lot of recipes for lemon-flavored ones. 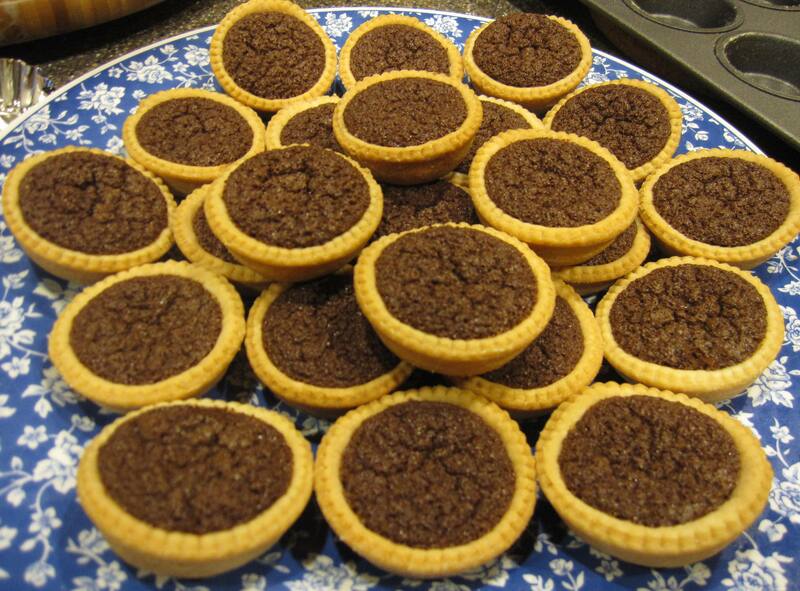 I decided to post the chocolate version of the Mini Chess Pies recipe for those who would like to try it. Strangely enough, my family doesn’t like them as much as they like the traditional vanilla ones, but who’s to say you wouldn’t like the chocolate ones better? The best way to find out is to give them a try yourself. Don’t forget to let me know what you think! Lightly grease the cups of two 24-cup miniature muffin pans. If using non-stick pans, no need to grease. 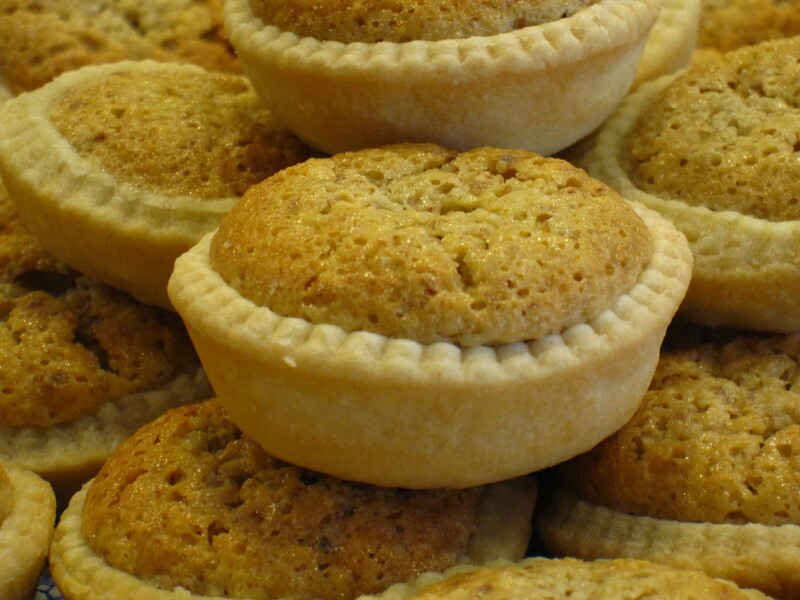 Unroll refrigerated pie dough onto a lightly floured surface and cut out 48 circles with a biscuit cutter in size needed to cover bottom and sides of each muffin cup. You will have some left-over pie dough which you can press into a ball, wrap tightly in plastic wrap and freeze for future use. Place 1 dough circle into each cup of muffin pans and press into bottom and sides using fingers or a tart tamper. In a medium bowl, whisk together eggs, sugar, buttermilk, melted butter and vanilla. In a small bowl, heat chocolate in microwave for 1 to 1½ minutes, stirring at 30-second intervals, until completely melted and smooth. Whisk melted chocolate into egg mixture. Pour into pie crusts in muffin pans. Bake 18 to 20 minutes or until filling is just set. Don’t overbake or pies will be dry. Cool in pans for 5 minutes, then transfer each mini pie to wire rack and allow to cool completely before serving. NOTE: If you would prefer to make your own pie crust from scratch instead of using ready-made refrigerated pie dough, here is a good recipe. Beat cream cheese and butter at medium speed with an electric mixer until smooth and creamy. You could also do this in a food processor. Gradually add flour to butter mixture, beating at low speed until well combined. Divide mixture into 48 balls and place one ball into each cup of muffin pans. Press each ball into bottom and up sides of muffin cup using fingers or a tart tamper. Cover and chill in refrigerator for 30 minutes before using.